Daith piercings have been recognized as an alternative treatment for migraines. While there are many causes of migraines and many ways of treating them there does not seem to be one method of treatment which works effectively for even a majority of migraine sufferers. At Piercing Denton, we are nurses not doctors and therefor do not diagnose migraines or specifically advise any particular treatment. We do, however, provide the highest quality and cleanest piercings available and will place the piercing for you if you wish to try it for migraine relief. I truly believe that alternative treatments work, but, I don’t necessarily believe every alternative treatment will work the same for every person. If you wish to skip the drugs used to treat migraines then you may well have to try several alternatives until you find the one that will work for you. Also many times alternative treatments are very subtle and work more slowly and less dramatically than drugs give each trial adequate time and pay close attention to how they affect you. We have included as much information as we could easily find and as we learn more we will add to this page. According to the National Headache Foundation, more than 29 million Americans suffer from migraines, and women are three times more likely to get them than men. They can be triggered by normal day-to-day tasks, such as eating specific foods, watching too much TV, fluorescent lighting, and excessive noise. They’re different for everyone and the yearning question is; what can you do to get rid of them? Of course there is the obvious medication route, neurologists often prescribe anti-depressants to relieve them, and there are over the counter pills like Excedrin, which seldomly cut it. With much frustration migraine sufferers have tried any alternative in the book, from switching their diets, to acupuncture, to meditation, to yoga, and back again with some success. With an open mind these alternatives are capable of being the answer, and there is a new one on the market, which is simple, inexpensive, and doubles as a piece of jewelry. The daith piercing is a small ring that pierces the inner cartilage of either ear, running through a pressure point, which for some will relive migraine pain. It is a relatively new procedure, mainly preformed at tattoo and piercing shops with not many statistics to back it up yet. Tammi Bergman, NP, of ERiver Neurology, who specializes in headache relief, says that she always encourages her patients to try things like this as alternative relief measures to medication. “I haven’t really heard of it yet, none of my patients have done it,” she said. “It could just be too new, and in the blogs, but often that’s where these things get started.” Medication for migraines is not always the only answer, just like the alternative relief measures the medicine doesn’t always work, and many people are opposed to taking medicine on a daily basis. “We don’t even have hard statistics on the medications for migraines that are approved by the FDA, so whenever you can do without it, it’s always a great thing. So if a patient is open minded I say go for it,” she said. Kimberly Glatz, 24, has been suffering from migraines for over a year now. She got the daith piercing done last month. “Before I got it done my headaches were really, really bad. Terrible. Just extremely painful,” she said. “Now, I’ve seen some difference, I don’t know if it’s from the piercing or not. I can’t exactly pin point what changed my headaches, but I’ve definitely seen an improvement and it’s worth trying,” she said. John Cushman, RNC, owner of the Piercing Denton in Denton, TX performs the daith piercing on clients, and he truly believes it’s the way to go. “I’ve had many people come to me looking for migraine relief. It’s a much cheaper alternative to medicine and even acupuncture, and many of their doctors recommend it to them, and if you’re into piercings that’s even better.” The piercing from start to finish is about a 10-minute process, it’s a one-time deal, and costs approximately $45. As opposed to acupuncture, which can become a lengthy, time consuming process, and be quite expensive. “Essentially it’s the same concept as acupuncture, the piercing hits a pressure point which then relieves the pressure in your head. I recommend getting it done on the ear that corresponds with the side of your head where most of your migraines hit,” he said. But the pressing question is, if there are no facts behind this than how can we know if it really works or not. Tammi Bergman says that you have to believe in migraine relief, in the alternatives and in the medication. “Sometimes relief of migraines is psychological, but that’s not a bad thing, it’s a mind-set. Sometimes you really have to believe it for it to work,” she said. In the long run it’s a toss up, it may not cure your headaches but you will be left with an ear piercing. Hey, you win some you lose some right? Daith piercings are a specific type of ear piercing. The ear cartilage midline toward the front of the ear is pierced. This type of ear piercing has been around for 3,000 years, but the name for this type of piercing was probably started in the 1990’s. The placement of the piercing is at the entrance to the ear canal and has symbolic meaning as the “Guardian to the Gate.” These piercing can be quite painful since they are through bony cartilage, and care must be given to keep them clean and to prevent infection. Migraines are a vascular type of headache. They occur more commonly in women and sometimes have a very specific trigger, such as certain foods. Managing of these headaches can be quite simple, from avoiding specific triggers to the use of Excedrin. However, sometimes those management techniques prove ineffective, making the headache hard to treat. One of the non-traditional treatments beyond medication has been acupuncture. One of the areas of needle placement has been in the ear, and commonly in the same general area where Daith piercings are placed. Recently, some people who have received a Daith piercing have coincidentally found improvement with their migraine headaches. It is not universal, and it is has not been studied formally. The correlation is based on the success for some people with acupuncture in the same region of the Daith piercing. If a person enjoys ear piercing and suffers from frequent headaches, it may be worthwhile to consider getting this spot pierced. Since body piercings are generally less than $100, this may be a very economical treatment alternative. If you suffer migraines and are very unsure whether you want a piercing, Trying acupuncture first would be a good alternative to determine if this treatment may be successful. If this is not working, and the migraines are not being well managed, further discussions with your medical practitioner about treatment options is warranted. 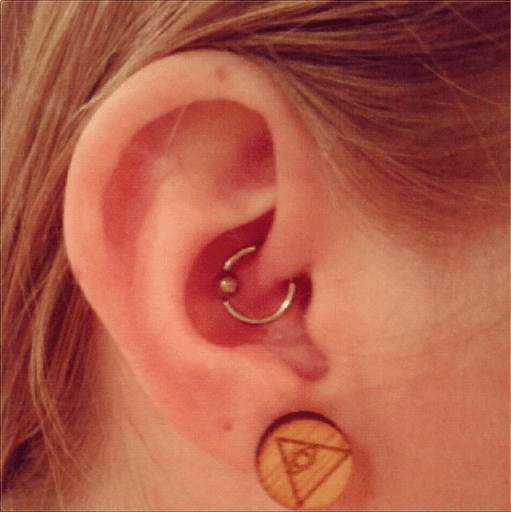 This post has received an incredible amount of views in the last few months, and many people have spoken out about their experience with a Daith piercing. However, I am a little disappointed to how some people are quick to chastise this option, saying it isn’t rooted in any concrete evidence. Many of those people likely saw the headline or skimmed the article and assumed I was simply trying get people to shell out more money for an unproven option that, in their opinion, can at best provide some pseudo-placebo effect. Having read their comments and seen stories refuting Daith piercings, I just wanted to clarify some misconceptions. First, anyone who read the above post can clearly see that we’re not saying this is a well-studied, documented and thoroughly researched alternative. Hopefully we can find more hard evidence, and scientists are learning more every day about the underlying reasons why regionalized stimulation may help with headaches. I wrote a recent post that sheds more light on the role the vagus nerve plays in the equation and how the medical community is continuing to search for concrete answers. Secondly, unless you’ve walked a mile in the shoes of someone who suffers from chronic pain or headaches, please don’t be quick to chastise potential solutions. Like many of this site’s readers, I deal with chronic pain (in my back), and at times I find myself at my wit’s end trying to manage and control pain. People who are considering a Daith piercing for their headache pain aren’t considering it as their first option, odds are they’ve seen specialists, tried therapies and medications, avoided certain trigger activities, altered their diets and their sleep schedules or undertaken a myriad of other treatments that haven’t solved their problems. Pain is a very personal issue, and having someone belittle a potential treatment technique, which appears to have worked for some commenters, adds nothing positive to the goal of solving the pain problem. Hope and belief that pain can be resolved is a key aspect of findings pain relief, and while people are certainly entitled to be wary of options lacking concrete medical evidence, I only ask that you consider the person in pain’s perspective before you belittle or demean their curiosity to this relatively new treatment avenue. I’m not trying to quell dissent and I thoroughly enjoy reasoned arguments on both sides of the spectrum, and I completely understand why it’s important to be hesitant of unfounded medical treatments, but if we ignored all potential solutions in their early stages simply because they had yet to be fully researched, the medical world would never evolve. Thomas Cohn, MD Interventional pain doctor helping Minnesotans manage back, neck, foot, and other pain. Board-certified in physical medicine and rehabilitation with additional board-certification in pain management from the American Board of Anesthesiology (ABA), the American Board of Interventional Pain Physicians (ABIPP) and the American Board of Pain Medicine (ABPM). The theory goes that 'daith' piercings relieve migraines, in a similar way to how acupuncture is used to help ease symptoms. Acupuncture, a therapy which began in China more than 2,000 years ago, involves placing fine needles at specific pressure points on the body's surface. The needles are then manipulated by a acupuncturist, either manually or electrically. It causes the blood vessels around the needle to open up and become wider, allowing for an increase in blood flow to the tissues in the immediate area. A report published in 2012 in the Archives of Internal Medicine analysed nearly 18,000 patients and doctors from eight universities and hospitals in the UK, US and Germany. The results showed in conditions including chronic headache, acupuncture was twice as effective as the drugs and exercise recommended by most doctors. The Migraine Relief Center recognises the link, albeit a unproven one, between 'daith' piercings and easing migraine symptoms. 'The principle is that the piercing mimics acupuncture by hitting a pressure point, which relieves the pressure in the patient's head,' a blog on the website states.